I ride everywhere. I often ride mountain bikes on singletrack, sometimes in mountain bike parks, and I even, after a fashion, know what I'm doing. I can, if I have to, do... stuff that mountain bikers do. Like drink their coffee, and their real ale. I can bunny hop. I can ride some of the difficult trails that mountain bikers ride. But somehow, I don't enjoy it like they do. I'm just.. not a mountain biker. Many years ago I used to hike and climb in the Scottish mountains. These are cold, wet, partially visible hills near the north pole. Despite this, lots of people go walking there. Sometime, back in the eighties, one of them must have visited Mount Tam, whence came the Commandments, and that person and their mates began crashing down through the walking tracks on bikes they bought at Halfords for fifty quid, while angry men - elderly, tweeded, but still hard - shouted and shook hickory walking sticks at them. Soon the bikers began building trail which more befitted their moxy; in those days there wasn't much to it, you found a very steep hillside far from any intereference (or any possible help if something went wrong), started an avalanche at the top, and cautiously leaned over to admire the damage. "Sound." But me... 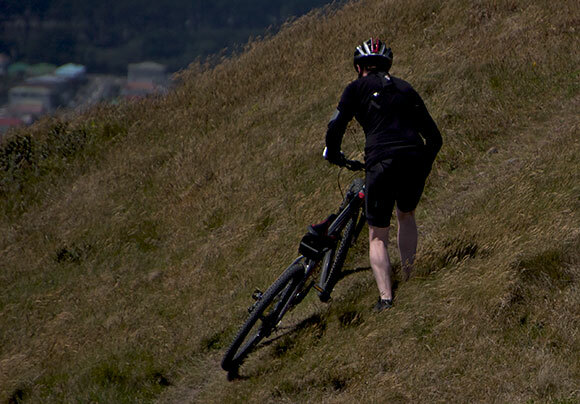 I enjoy singletrack, but not the fearsome stuff, and actually, not even the rough stuff - bumps, drops, tree roots etc. This kind of riding just really isn't my thing, and I have to admit that after a while I just find it irritating - I didn't buy a bike to shake it and myself to pieces or drop it off a cliff and try and survive the fall, I bought it to ride over the mountains and get to places. Dodo on Hawkins Hill; skillful. I still love riding in the forest. Big ups to the guys who build these trails. They do it for free and for the love of what they do, and I'm sure that because of them, a lot of people have taken up cycling who might not have otherwise. But I'm not really a mountain biker. Give me the service road every time. Main photo: Maori Gully, Mount Victoria & Miramar from (probably) Barking Emu, a trail south of Brooklyn wind turbine, Wellington.